Located right across from the beach! Come and see what Sunny Isles Beach is all about. Take long walk and enjoy the warmth of our beaches. This 2 bedroom and 2 newly remodelled baths unit with a large balcony (view: Northeast/part ocean view), new tile, Sleeps 5 people, 24 hour security, onsite restaurant. Great vacation rental for the whole family. Call me for more pictures or if you have any questions. This rental is right on across from the beach. We are located on Collins and 158th street - 20 minutes from South Beach's spectacular night life. We are also close to restaurants and shopping malls like Aventura Mall and 30 minutes from Miami Beach's Convention Center and Miami's International Airport. 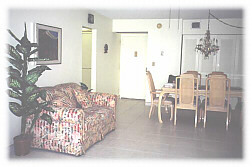 -- and only 15 minutes from Fort Lauderdale International airport. Please ask if you need any further accommodations. Assigned parking space. Additional visitor parking on roof level of garage. This rental is located right across from the beach (a 5 min. walk) on collins Ave. There is also a small cafeteria/restaurant inside the building and also a laundry room on each floor. There are many night clubs in the South Beach area which is very close. The night life is great here and the days are warm and sunny full of beach fun. Rates may vary, always inquire. Note: Will give you special rates for 3 months minimum Seasonal Rental from October-April.